The “fo'c's'le” of the family canal boat was converted into a pilothouse so the helmsmen can come in out of the weather, join the conversation of the guests, and enjoy the heat of the woodstove. 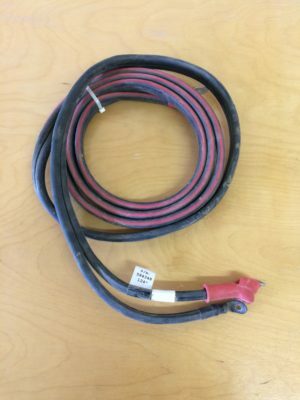 Sticks and strings provide remote control of the tiller and the outboard’s throttle and kill switch. 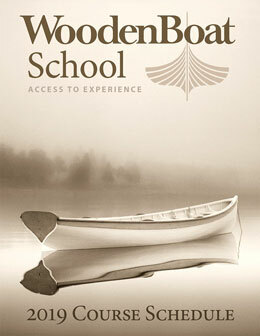 The Pooduck skiff provides a good feel for traditional boatbuilding. 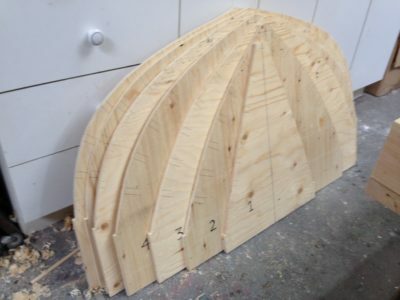 After it leaves the shop, it is easily tailered, well suited for rowing, and gorgeous under sail. 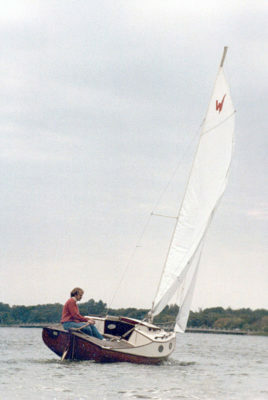 It carries a lug-rigged mainsail that can be sailed with or without a jib. A cleverly designed mast partner allows the mast to be angled forward or backward to keep the rig balanced whether raising the main alone or the main and jib. 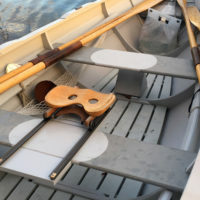 The Eel is an 18’ 6” canoe yawl designed by William Garden as a slightly shorter and much lighter version of the original Eel designed by George Holmes in 1895. 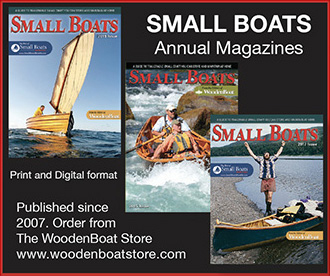 Holmes was one of the pioneers of the canoe yawls that became popular in England at the end of the 1800s, when recreational boating was then in its early stages. 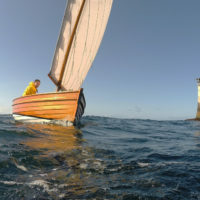 Will Stirling set a goal for himself to sail around every one of Britain’s 50-plus offshore lighthouses. Nic Compton joined him for an 8-mile passage from Land’s End to the Wolf Rock Light. They sailed a 15’ dinghy, anchored near the wave-washed rock, and swam to the lighthouse in dry suits. 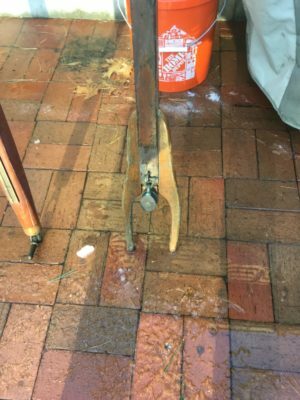 Sliding seats are commonly associated with outriggers and long oars, but Ben Fuller found he could rig some of his boats with a sliding seat and add power to his rowing without changing oars or gunwale-mounted oarlocks. The Independence Seaport Museum is not only preserving artifacts of the past, but is also keeping traditional skills alive by passing them along to the youth of Philadelphia. 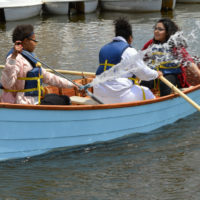 This year the Workshop on the Water, the museum’s working boatshop, brought groups of high-school students together to build a pair of flat-bottomed skiffs. Smart phones are as valuable afloat as they are ashore, but require reliable protection from the water. We take a look at two unusual waterproof cases. The GoBag is a transparent case with a magnetic closure that assures a tight seal every time. The Ugo holds a phone behind a window and keeps other essentials in partitioned space behind it. A waterproof zipper provides easy access when open, a reliable seal when closed.